The gate at the entrance to Queen’s Park is impressive at the best of times, but I think even more so in the snow. This entry was posted on January 2, 2010 at 12:01 am	and is filed under Uncategorized. 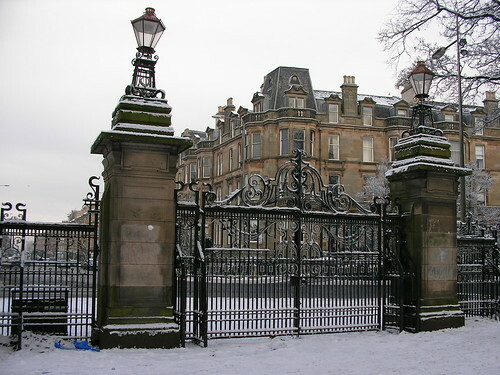 Tagged: gate, Glasgow, Queens Park, snow. You can follow any responses to this entry through the RSS 2.0 feed. Both comments and pings are currently closed. That’s a fine wrought iron gate too. Locked to keep people out? Jackie, the snow on the gates makes this have the appearance of a magical entrance…perhaps the entrance to a Winter Wonderland?! Fantastic!!! I have a Glaswegian friend over for the holidays, and we’re planning my next trip to Scotland. Haven’t been in ages. Your daily photos will bring me there in the meantime. Thank you!! A belated Happy New Year to you too, La multi ani! and all the best in 2010.